Well it was dinner with Ted and Judy again last night – my favourite “restaurant” ;-). I can’t get over the cooking that these friends do! So last night we had a starter of mussels which where so good I totally forgot to photograph them as we just dove into the bowls. Trust me they were delicious. The rest of the meal was no exception. Actually I have to backtrack….I was starving when I got to T&J’s place as I had forgotten to eat lunch. 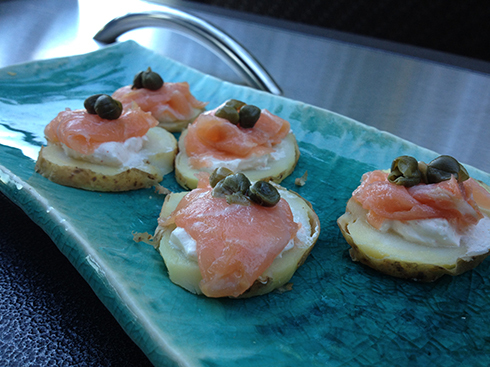 Judy had some smoked salmon which she artfully put on top of a tiny dollop of hungarian cream cheese (made with paprika – yes it was awesome) on a thin slice of left over roast potato. Topped with a couple of capers it was an appetizer fit for any restaurant. 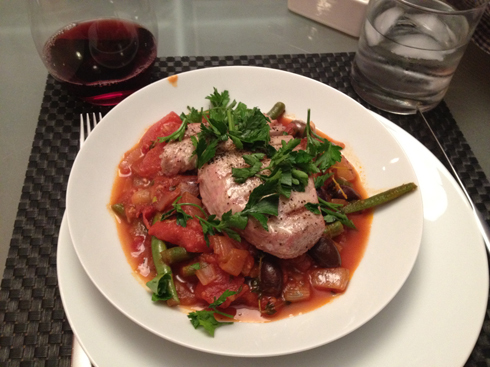 Later we had the mussels followed by a tuna dinner that was out of this world! Ted got some sushi grade tuna from a local fish monger and covered it in sesame seeds with a bit of black pepper ground on top. He seared it for 3 minutes per side in a hot cast iron frying pan. 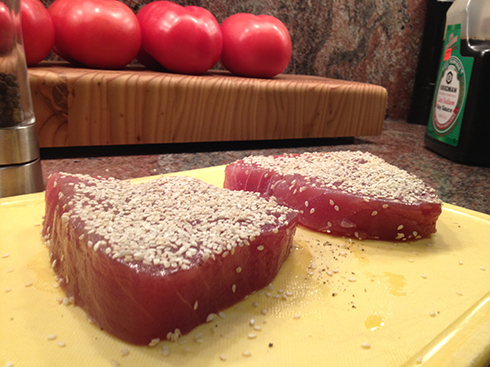 Prior to cooking, Ted made a small dish of sauce to go with the tuna. Mix the ingredients below and add to taste. It really does take on a different taste though once you drizzle it over the cooked tuna. 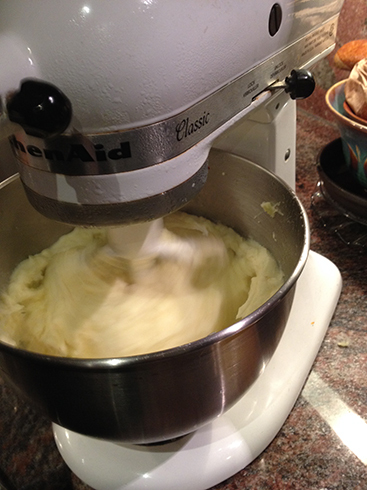 Along with the tuna Judy made her secret mashed potatoes – all I can tell you is there is some butter and her secret weapon is a mix master ;-). They are the smoothest creamiest potatoes ever. 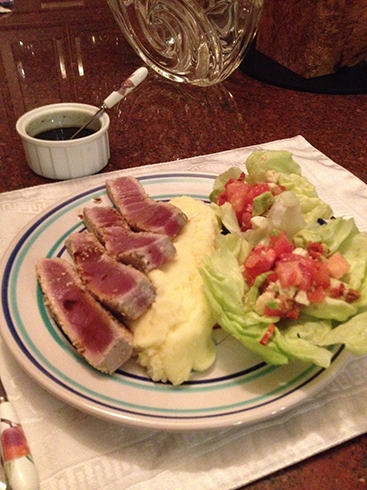 The tuna was timed perfectly for when the salad and potatoes were done. Plated, it looked fit for royalty. What an outstanding meal! I of course got to take home the leftovers. Thanks again to my favourite restaurant! 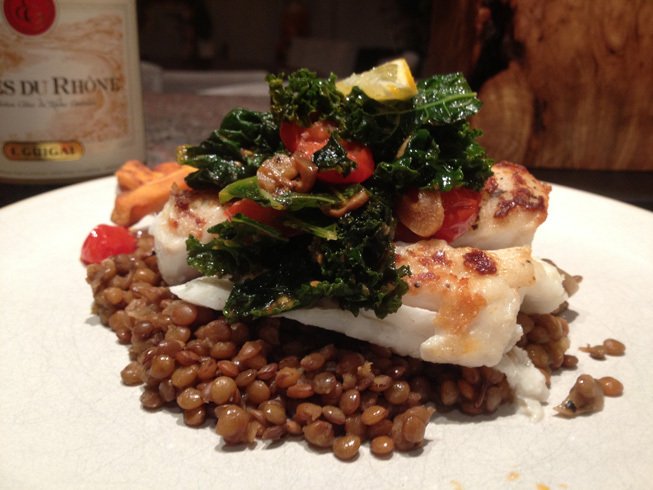 Umbria lentils – wonderfully nutty but take a bit longer to cook than regular dried lentils. Cod – beautiful large meaty piece of cod seared to perfection and popped in the oven at about 350 degrees for a few minutes to finish it off. Topping – Kale (cut into small pieces) sautéed with garlic slices and grape tomatoes in a light chicken broth. Scrumptious! Side of baked sweet potato fries baked at 400 degrees for about half an hour. All topped off with a squeeze of Meyer lemons (these are my favourite lemon – a cross between a tangerine and a lemon, they are both sweet and sour at the same time). What a meal – it was so good there wasn’t even a lentil left on the plate! Here is the recipe from yesterdays blog about seared tuna – The chef is Tracey Bochner – a fabulous cook along with her husband Chris who could open a bakery that would have line ups on a daily basis! In the meanwhile, lightly coat fresh tuna steaks in olive oil, salt and pepper and grill until desired doneness. Serve the grilled tuna on top of a generous serving of sauce. I think this is best served in pasta bowls. Definitely needs to be accompanied by a crusty baguette. This is also good with frozen tuna steaks that aren’t fresh enough to be seared and served. Instead of grilling, cook the steaks in the sauce. I’ve also done this with tilapia and it works, but isn’t as tasty as tuna. I had dinner the other night with friends (who happen to be fabulous cooks) and thought I would share the gorgeous presentation and meal with you. 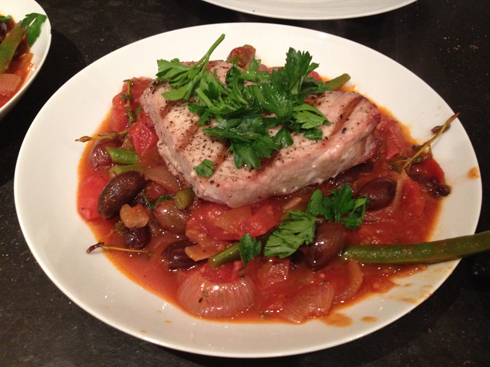 The main course was seared tuna on a bed of simmered tomato with green beans, pitted olives and I think sprigs of thyme. I have asked for the recipe and when it comes I will share it and give the chef her due. 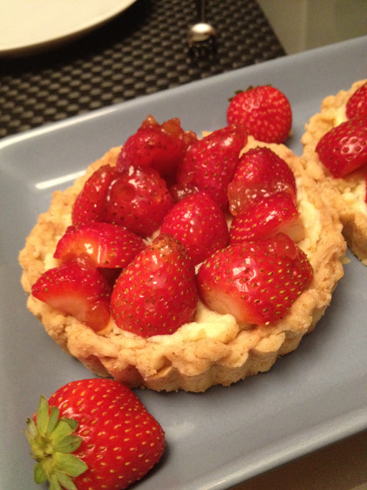 Meantime for dessert we had the most beautiful strawberry tarts homemade of course. Everything was so delicious I am still talking about it days later. See below for some pics of the meal. Promise to forward the recipe as soon as it comes.